Quercus coccinea.Copyright © 2001 by Kevin C. Nixon.www.plantsystematics.org. (Accessed 9/2014). Quercus coccinea is a tree to 25 m tall; about 100 cm dbh; red oak group (subgenus Erythrobalanus); bark dark, rough with narrow smoother patches, roots associated with ectomycorrhizal fungi (Decker and Boerner 1997); terminal winter buds less than 0.6 cm long, hairy, tips often whitish and blunt. Leaves alternate, hairless, more deeply lobed, than red or black oak, lobes 7-9, deep per side, usually with secondary lobes or large teeth, sinuses wide, rounded, upper lobes usually wider than lower, lobes and teeth bristle-tipped. Fruit acorns 1.5-2 cm, cap 1.6-2.2 cm wide, over 0.6 cm deep, covering 1/2 acorn, thick, often wider than long, scales rather large, tightly appressed (larger than those of Q. palustris), often shiny, tip of acorn often with concentric rings (Harlow 1946; Petrides1988), tannin content high, matures 18 months, Sept.-Nov. 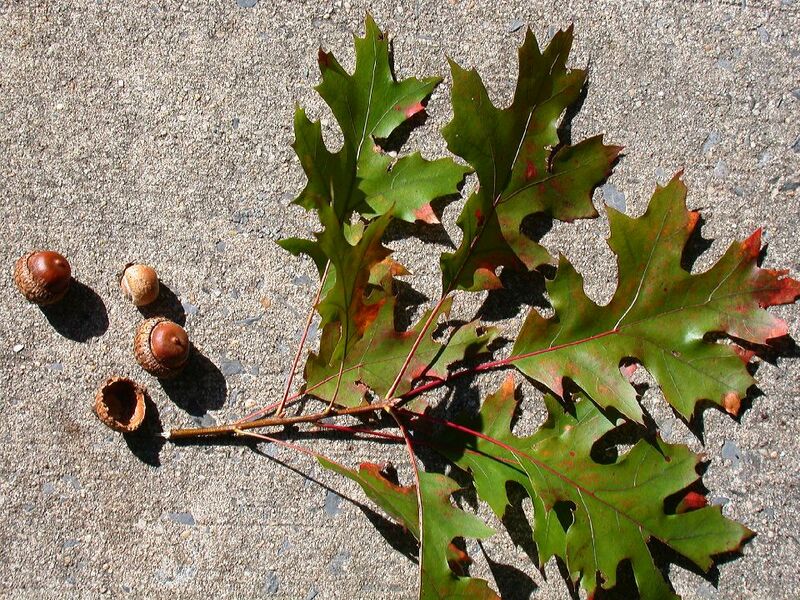 Seeds dispersed by squirrels, blue jays and other animals that bury acorns. Acorns killed by nut weevils (Curculio sp.) and Cynipid gall wasps. Acorns eaten by many birds and mammals that do not bury nuts (raccoon, foxes), (Martin et al 1951). Habitat: Tolerant of drought. Moderately ozone and salt tolerant (Sinclair et al. 1987). Intolerant of soil compaction, flooding, shade, index 2-4 (Hightshoe 1988). Not found as saplings in understory of closed forests. Soil pH 4.5-6.9 (USDA, NRCS 2010). Notes: Often planted as a street and park tree.Foliage eaten by Gypsy moth larvae and other insects (see Q. alba). Stump sprouts more readily than other oaks when cut. Deer and rabbits eat twigs, other animals eat buds (Martin et al 1951). Susceptible to fire damage that allows entrance of fungal infections. Quercus sp. in the red oak group are generally less drought tolerant than those in the white oak group (LeBlanc 1998). Attacked by oak wilt (Ceratocystis fagacearum), and cankers caused by Nectria spp. and Strumella coryneoidea. Defoliated by gypsy moth larvae (Lymantria dispar) and other insects. Damaged by various wood boring insects. Scarlett oak is also attacked by larvae of the scarlet oak sawfly, Caliroa quercuscoccinneae which skelontonizes leaves, adults damage leaves while laying eggs. The larvae are slimy, greenish-black, this insect is preyed upon by the parasitic wasp Trichogramma minutum (Hymenoptera, Trichogrammatidae) which lays its eggs in the sawfly eggs. Protozoans of the genus Herptomonas, is a pathogen of late-stage sawfly larvae (Burns and Honkala 1990; Sinclair et al. 1987; Johnson and Lyon 1991).